The title literally means "The Fifth Child" in German language. OK so, this is just a remake of my past wall which you can find HERE. And I can honestly say that, when I look back at it----it kinda looks crappy TBH. Hahahaha. Oh, those were the days. LOL. I might be remaking a lot of my past walls----but I must not speak so soon. Haha. Anyway, I think I did this in about 3-5 days (in our office)----LOL. But only when I have the free time. I still discarded the rocky terrain beside Kaworu because (1) it looks weird AND/OR (2) I can't recreate it. (TT^TT) Poor me. Haha. But this time, I made sure that the planet is round and the field of stars very distinct and bright. :D And YES, since I can't make a decent field of stars, I used stock images that I found online. Original scan can be found HERE. Hope you guys like it! Enjoy! Wow, this is awesome. Thanks for sharing it! Beautiful background. Thanks for sharing man. 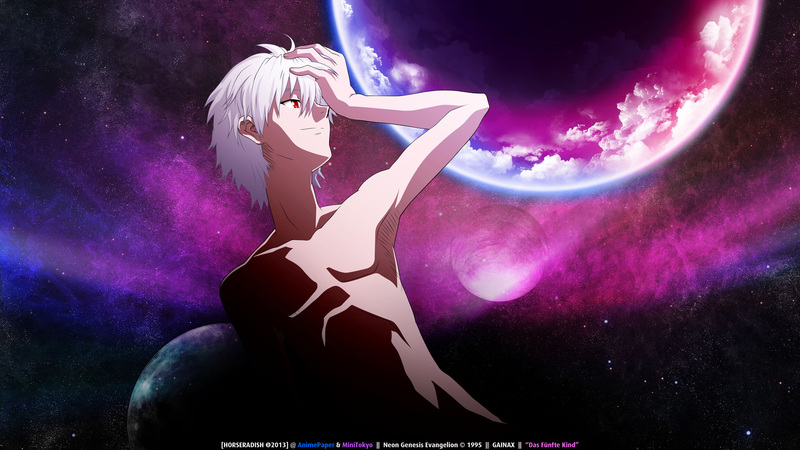 I love him *_* Kaworu-kun is very very very hot! Such beautiful progress. I love it when people remake something :) and this is so sharp! The only thing I'd add would perhaps be more shaded details on the darker portion of his hair and some of that blue/purple lighting coming from the left and illuminating the edges of that left part of his body that's completely in the shadows. Why so.....German :P It's really ironical. Today I just watched the new three movies with a firend. It would be interesting to see some shades of purple and pink in his hair and a few in his body for more hipster like effect (I can't think of the word I want to say) but it's already looking good as it is. The improvement is fantastic. The colours are good. They fit really well. The pink in the background reminds me a bit of a mac. Haha. But overall this is a good remake dude. like mentioned there is improvement ! I can remember this from some time ago to now, I rather enjoy the improvement, nicely done.